Welcome, and thanks for your visit. We are a China based UV flatbed printer manufacturer and have been awarded the ISO9001:2000 certificate. Here we will introduce you anther kind of UV flatbed printer. 1. Both 4 color and 8 color printer are available here. Designed with 8-16 Konica Minolta printheads, this UV flatbed printer has a maximum printing speed of 38sqm/hr and a printing format of 1.83m x 3.20m. 2. This printing machine is able to print on materials with a thickness of 10cm, and the highest printing resolution is 1440 x 1440dpi. 3. Due to reliable performance, our printers are CE, UL, FCC certified. For more information, please refer to the specification table. Due to its fast printing speed and high image definition, this kind of UV flatbed printer is widely applied to printing on corrugated paper, foam core, PVC, ceramic tile, synthetic glass, wood, metal sheet, paper, advertising banner, mesh fabrics, adhesive vinyl, etc. The images printed by this printing equipment are water-proof, anti-ultraviolet, scratch-resistant, and bright in color. To satisfy your different applications, we also manufacture kinds of color inkjet printer and eco solvent printer with different printing heads, printing speeds, and printing colors. These products are reliable in quality and low in price, and are very popular with customers in more than 40 countries. For any inquiry, please feel free to contact us! ShenZhen Runtianzhi Digital Equipment Co.,Ltd. looks forward to working with you. File formats Bitmaps, TIFF, JPEG, Postscript 3, EPS, PDF etc. Media Types corrugated paper, foam core, PVC, ceramic tile, synthetic glass, wood, metal sheet, paper, advertising banner, mesh fabrics, adhesive vinyl, etc. The information above might change without our prior notice. Flora PP2512UV Eos UV Flatbed PrinterThis Flora PP2512UV Eos UV flatbed printer realizes excellent photo like printing effect and it can shows the words in 2-point font. Flora F1 320UV Turbo UV Wide Format Digital Inkjet PrinterThis Flora F1 320UV turbo UV wide format digital inkjet printer is mounted with 8 Konica Minolta print heads and it supports 4 colors printing. F1 180UV-4K Hybrid UV Flatbed Printer This type of UV flatbed printer adopts 4 Konica Minolta print heads and features fast printing speed. It is suitable for corrugated paper, foam core, PVC, ceramic tile, synthetic glass, wood ..
F1 320UV Roll to Roll UV Printer The printing color ranges from 4colors (CMYK) through 5colors (CMYK+W) to 6colors (CMYK, LC, LM). 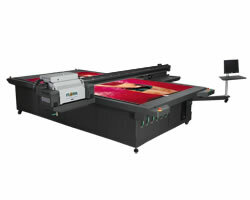 The highest printing speed is 55sqm/hr and the mixmum printing width is 3.20 meters ..